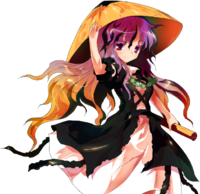 Byakuren Hijiri (聖　白蓮, Hijiri Byakuren) is a Buddhist nun and magician who was sealed away by humans because of her kindness towards youkai in the outside world. During the events of Undefined Fantastic Object, the youkai she has saved reappear to break her free from the seal. She is now the head priest at the Myouren Temple, which is populated mostly by youkai. 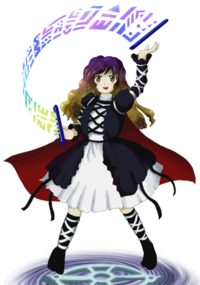 Byakuren first appeared as the final boss of Undefined Fantastic Object, later appearing as a playable character in Hopeless Masquerade and Urban Legend in Limbo. She was a target for Stage 12 of Double Spoiler and the Final Day of Impossible Spell Card. Byakuren is a monk who is kind to both humans and youkai. However, it is somewhat difficult for her to befriend humans because of these views, as well as the fact that she doesn't drink alcohol and is a vegetarian. She is mild-mannered and has never been seen to be overly angry. Youkai that don't desire conflict flock to her, while those that do are repulsed by her. Originally derived from Buddhism, Byakuren then began using dark magic derived from aiding youkai to retain her youth, after her brother's death. Now, Byakuren specializes in "buffing" magic which increases her physical abilities, including strength, speed, and the five senses. In Undefined Fantastic Object, the spell card Superhuman "Byakuren Hijiri" seems to demonstrate this magic. During this spell, Byakuren's movement speed increases to such an extent that she can even outrun Fantasy Seal. Normally, however, she's only as strong as an average human. Ultimately, though she is called a saint, these powers are demonic in nature. Byakuren is the chief priest at the Myouren Temple, where her main goal is to bring peace to both humans and youkai. As the chief priest, she teaches the dharma to anyone willing to listen. She also manages funerals and the graveyard. Once a month, she performs an "overnight sutra-chanting live concert", where she sings a song in monotone while keeping rhythm with a wooden fish. The event attracts both youkai and humans. Created while Byakuren was in Makai, the Sorcerer's Sutra Scroll is unique to her. The sutras Byakuren needs in order to use her power are written on it. It has an automatic mode, which will cause it to recite spells on its own. Compared to a regular paper scroll, the amount the Sorcerer's Sutra Scroll holds is limitless. It is also said that this scroll won't deteriorate over time. Lastly, because it has a "will" of its own, no one except for Byakuren is able to handle it. Once a human, Byakuren was a nun who worked with her younger brother, Myouren Hijiri. However, when her brother died, she began to fear death. This fear prompted her to search for some way to maintain her youth. Eventually she did find it; however, its origin was not in the Buddhist art she had dedicated her life to, but rather a kind of black magic. No longer fully "human", she soon came to fear losing her power. Because of the nature of the world of Gensokyo, the magic that she wielded would only be lost if humanity came to reject it as a whole; and because of that, she needed to ensure the prosperity and longevity of youkai. Thus, she came to honor and protect the youkai for her own benefit while simultaneously making herself out to be a great youkai exterminator. People came to look up to her and started fearing the youkai less and less. However, after some time, Byakuren started to realize the struggle youkai faced in the outside world. Eventually, rather than protecting them out of her own selfishness, she began to honestly consider the youkai as beings that needed to be helped. At one time, Byakuren was sent to exterminate the ghost on the seas, Minamitsu Murasa, who had gained much infamy for sinking ships. Rather than vanquish Murasa as she had been sent to do, Byakuren confronted the spirit as a normal human, and Murasa easily capsized her ship. However, Byakuren rose from the sea, riding atop a shining ship like the one Murasa had fallen from. By granting Murasa this ship, she freed the spirit from the cursed oceans and earned her gratitude. At some point she also welcomed Ichirin Kumoi and her nyuudou companion Unzan, gaining their trust as well. The two of them lived at her temple. The temple that she lived in was in the mountains; a temple to the god Bishamonten. In order to gain the trust of the youkai living on the mountain, she decided to appoint a youkai to serve under the god. This youkai was Shou Toramaru. Shou excelled at her duties, and it is implied that in doing so, Byakuren came to be liked by the youkai living around the area. Eventually, her desire to help youkai rather than exterminate them was exposed to humans such as with her encounter with Murasa. She was ostracized for being a "demon in human form", and eventually was sealed away into the depths of Makai, forever locked in Hokkai. Byakuren, as she appears in Symposium of Post-mysticism‎. Myouren Hijiri, Byakuren's younger brother, was a real Buddhist priest born in Shinano Province, which is ZUN's hometown, and trained at Chougosonshi Temple (朝護孫子寺) on Mount Shigi (信貴山). He appears in several stories, but the most significant one is Shigisan Engi, which is one of the most popular emakimono. In its third volume, there is an unnamed Buddhist priestess who wants to meet Myouren, who is her younger brother. She is the inspiration for Byakuren. The priestess is looking for Myouren because she is worried about him not coming back, so she stays at Toudaiji, where Myouren had made the vows for priesthood. Daibutsu tells her in a dream that there is a purple cloud over the side of the mountain southwest from where she is. She goes there the next morning, and finally she is able to meet and live together with him. Byakuren Hijiri (聖　白蓮) is her name. Hijiri (聖) can mean "Saint", "Virtuous Monk" or "Itinerant Monk" whilst Byakuren (白蓮) can mean "White Lotus" or "Purity". So it literally can be read as "Saint of the White Lotus" or "White Lotus Saint"; drawing upon the cultural reading of the white lotus as a symbol of purity – "Pure and Saintly" or "Saint of Purity". It may also be drawing upon the modern definition of Hijiri (聖, meaning a world-trekking Buddhist monk) – "Roaming Monk of the White Lotus" or "The Pure and Itinerant Monk". In Undefined Fantastic Object's official art, Byakuren has long, wavy, light brown hair that fades to purple at the top, with hazel or light brown eyes. She wears a black and white dress with long strips of black fabric going across the middle and white fabric across the arms. Along with this dress, she wears a long cape. She also holds a giant, magical scroll called the Sorcerer's Sutra Scroll. From Hopeless Masquerade onward, she wears a wide-brimmed hat and shiny green beads. The gradient in her hair has been confirmed by ZUN to be a natural colour. 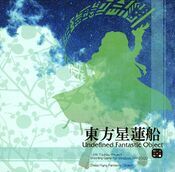 In Undefined Fantastic Object, she is unsealed thanks to the combined efforts of Shou Toramaru's group of youkai and the heroine. Her fate depends on which heroine is chosen by the player, but in canon, she settles down near the Human Village with the intentions of building a temple there. By Sanae Kochiya's request – the shrine maiden had vouched for Byakuren's character – Kanako Yasaka and Suwako Moriya constructed it for her relatively quickly. After apparently reading the newspaper by the tengu about a mischief-making amanojaku, she becomes one of the many strong youkai and humans to try and stop Seija Kijin in the final day. She uses spell cards that are considered impossible to dodge. Being the final boss of Undefined Fantastic Object, Byakuren serves as the common ground for the character relationships. Ichirin Kumoi is a youkai who used to live at Byakuren's temple hundreds of years ago. By showing kindness to both her and Unzan, even though she was human, she earned their trust. Byakuren saved Minamitsu Murasa from her grim fate of haunting the oceans and capsizing ships. Minamitsu became one of Byakuren's strongest allies, and she used the flying object in Gensokyo to retrieve the treasures needed to revive the nun. Shou Toramaru was a disciple of Bishamonten that lived at Byakuren's temple. 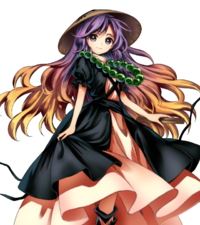 Byakuren had used her to gain more trust from the other youkai living on the mountain at the time, and in order to show her kindness towards youkai. It is also known from both Touhou Hisoutensoku and Oriental Sacred Place that Nue Houjuu is currently living at the temple she built. Nue, after learning from the heroine during the extra stage of Undefined Fantastic Object of Byakuren's kindness to all beings, including youkai like her, went there, most likely after a bit of time had passed and nervous because she was attempting to ruin the plans to unseal the nun in the first place. Also, Nue calls in her friend Mamizou Futatsuiwa from the outside world to become a youkai ally. After being suggested by Youmu Konpaku in her respective Extra stage, she decides to take up residence at Myouren Temple with Nue. She also had a brother named Myouren Hijiri. However, her brother eventually died. Kyouko cleans the Myouren Temple. Miko targets Byakuren. While they have not been seen interacting, Byakuren is highly disturbed by Seiga's activities and claims that she can sense great evil from her. 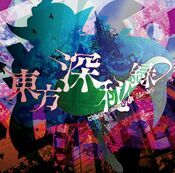 Byakuren believes that Koishi's present "thoughtless" state is close to enlightenment, and wants her to join the temple. 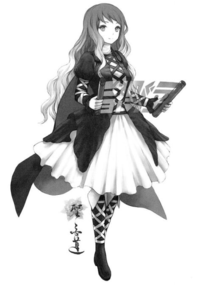 During the events of Hopeless Masquerade, Kokoro stays at Myouren Temple in order to learn how to control her emotions in order to prevent another berserk at the end of Byakuren's storyline. 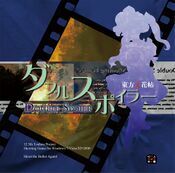 The silhouette of Byakuren occupies the front of Undefined Fantastic Object's jewel case. 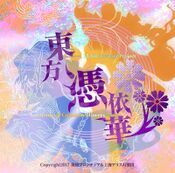 Byakuren was one of the candidates for the extra boss of Ten Desires, along with Kasen Ibaraki. Written in ZUN's hand on her final cut-in is Namusan! (南無三！), which is short for Namu Sanbou (南無三宝) - roughly, "Hail to the three treasures of Buddhism" (the Buddha, Dharma, and Sangha). It's used to request salvation in a moment of danger. Byakuren also uses this term at the very end of her dialogue with the heroine. During her second-to-last (fourth) spell card on Easy, the stars under the health bar show she has two lives left. She does, but only on higher difficulties. 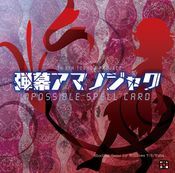 The same spell card looks like one of Shinki's attack patterns. Byakuren's Lotus Butterfly seems to be a reference to YuugenMagan's evil eyes. The two share a similar presentation and shoot similar danmaku patterns. This, of course, makes sense as Byakuren, like YuugenMagan, appears in Makai. In Undefined Fantastic Object, Byakuren has no hitbox after her third spell card. This is likely a glitch. In Oriental Sacred Place chapter 12, Byakuren's hair is lighter on the top and gets darker towards the bottom. With Miko's appearance and revealed conflict with Byakuren with their use of Buddhism they show signs of being a reference to Hokuto No Ken where Byakuren is Toki, a peace loving pacifist that wants only to help people and hates violence when it can be avoided, Miko is Raoh in this case. 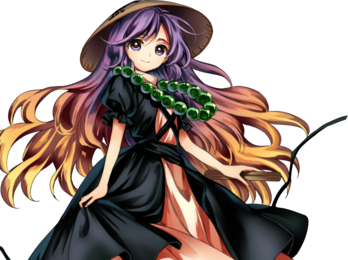 Byakuren's friendliness towards youkai and her ability shows some similarity to Xuanzang, a monk who was sent to retrieve the Sutras from India in Journey to the West. Byakuren's sibling Myouren was a famous monk. He could easily make a bowl fly away, and use it to take storages from stingy billionaires for himself, and cure sick people's illnesses in remote places. Byakuren, getting along in years, learned Buddhist magic from Myouren. She normally lived on Flying Storage, which was packed with Myouren's Buddhist power, and so naturally Byakuren gained power of her own. However, Myouren died before Byakuren. The bereaved Byakuren started to fear death greatly. She obtained the power to regain her youth, but rather than a Buddhist art, it was something more like black magic. After having mastered the power of youth and left behind a normal creature's lifespan, the next thing she came to fear was someday losing her power. The only way to lose that black art was for humanity to reject it entirely. In other words, if youkai ceased to exist, she wouldn't be able to sustain her own power. And so, she honored youkai. She pretended to be a great youkai exterminator, but actually saved the youkai behind the scenes. She had great respect for youkai, but not because she disliked humans. In the beginning, it was born from her own greed, but as she learned of the difficult past the youkai had borne, she began to think she needed to do something to help them. Her youth and her magic made her extremely popular among humans. "As long as Byakuren is here, we don't have to fear youkai anymore. We don't need to live in fear of the night anymore." And so the gap between her wishes and the expectations gave birth to a terrible tragedy. People began to call her a demon in human form. She was sealed away in Makai, never to appear before humans again. The Myouren Temple was bustling with people. But their goal wasn't to receive the teachings of the Buddha. who were called "justice", in this world without rules. Repeating "power is a means, not an end", she enters the gaudy battle. Before activating a special attack, Byakuren must first recite a chant. consumes the charge and uses the special attack. and if you want to use a different special attack, she must recite a new chant first. the special attacks themselves are more powerful. she performs a series of burning attacks. so she can catch opponents that are far away. it is truly a show of the greatest superpower. With faith as the basis for her martial arts, she’s a specialized character for close-range combat and spacing. She has a system called Chanting which allows for a handicap in the application of the finishing move; in this game you can choose freely what finishing move to use as long as you have a chant, and chanting for a prolonged period of time opens up several new possibilities, such as the ability to stockpile them. Her Occult Attack “Silver Sky-way” lets her rush freely through the sky. "You were possessed by an evil spirit just now! You have to resist it, or you'll die!" The head of the Myouren Temple, a Buddhist temple that accepts even youkai. Regarding the incident as dangerous, she sets out to investigate the Perfect Possessions. This page was last edited on 16 December 2018, at 07:32.